In January 2016 I was lucky enough to attend a course at West Dean College called “Greenwood spoon carving with traditional tools”. As a keen woodworker with a reasonable amount of experience, I was interested in learning from a real expert. West Dean is an amazing place for art and craft courses and Nic Webb, our tutor, was not only a brilliant craftsman but an excellent teacher. I left West Dean 2 days later with 3 lovely spoons and a real passion for carving them. The humble wooden spoon is easily taken for granted. My friends all thought it was quite strange that I could dedicate precious time to what, at first glance, seemed to be a somewhat trivial activity. The pile of chippings on my sitting-room floor was certainly a source of amusement (they sweep-up very easily from parquet flooring, whereas with carpet I would think twice). However as the stack of spoons outgrew the chippings (the picture shows only a fraction of what I have made), the comments became more complimentary and requests for spoons started with more and more people interested in having a go themselves. 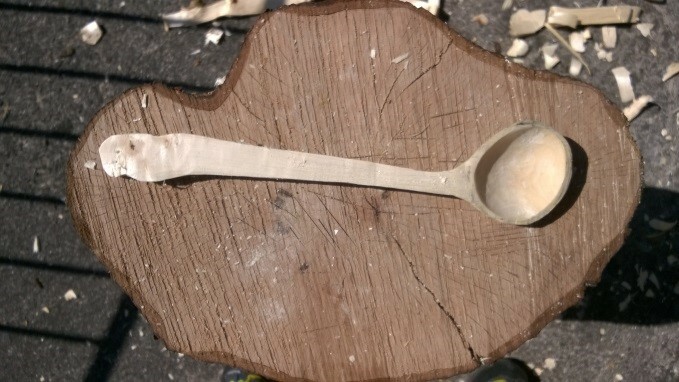 The fact is, making a spoon from a simple piece of greenwood is a hugely satisfying process, resulting in a rather attractive and useful object. It doesn’t take too long, nor does it require enormous effort. The tools you need are inexpensive to acquire and really quite simple to use, though there are some seriously sharp blades involved so its a good idea make sure you know how to use them safely and keep them sharp. What follows is a short description of how I make spoons from greenwood. It is by no means the only way (and very possibly not the best way either) but as the pile of spoons testifies, is one I love. The process begins with a log of freshly cut timber. I have reasonable access to hardwoods such as birch, sycamore, ash, willow and hazel. If I am lucky I manage to get my hands on wood from fruit tress such as cherry, apple, pear or plum. I cut the wood to a length about 1½ times the length of the desired spoon. Knots in the wood are much harder to work, so I would try and choose a section where there aren’t too many branches. The piece of wood doesn’t have to be straight as a natural curve can be utilised for the shape of the spoon. The wood is split along its length to produce a billet from which the spoon can be carved. I have an old traditional tool called a “froe” which I really like, but an axe will also work fine. The force to split does not come from the froe or the axe but from a wooden or leather mallet. I draw the outline of the spoon bowl onto the billet with a pencil based on looking at the grain I can see in the split log and allowing the wood to suggest a shape. The handle of the spoon can also be drawn but generally I only mark the very top part. With the handle it is really the wood grain which dictates shape so all I am doing is marking where the handle will connect to the bowl. 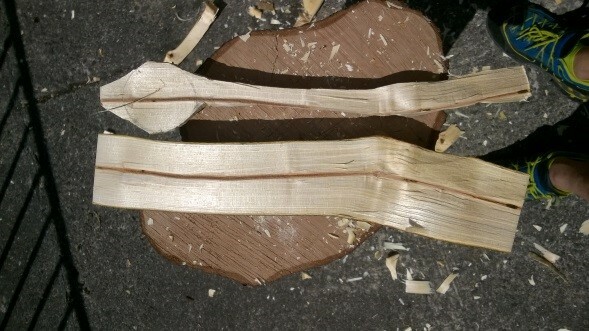 Initial shaping of the spoon is done with an axe. This may sound dangerous to some but by holding the axe around the neck you actually have very good control and it is an excellent way of removing wood, either by splitting or, as by carving using the weight of the axe head to do the work for you. 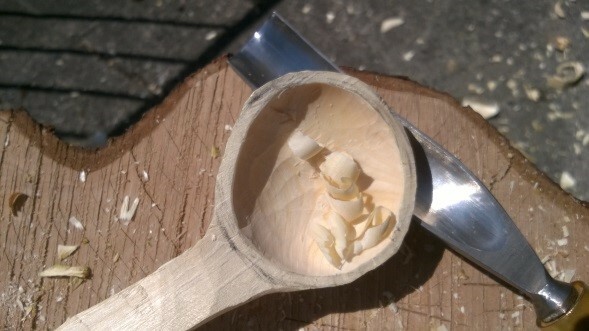 Once the shape of the bowl is finished you can turn the spoon over and think about hollowing the bowl. I mark the thickness of the walls I would like with a pencil and then use a gouge to carve out the bowl. This is one process I really don’t like doing with the spoon held in my hands. It takes two hands to properly control a gouge and the tendency, especially at the beginning when there is no proper hollow, is for the tool to jump. I therefore mount the wood in a vice to save on the need for first aid. Once the hollow is roughly cut, the finish can be improved with a bent gouge or a crook knife. Like with the reverse side of the bowl, the aim is to get a nice smooth finish with no tool marks and to make sure that the wall thickness is even. The final part of the carving process is to finish off the handle of the spoon. I always do this last as it provides support while carving the bowl and if the handle is too fine it might snap. The spoon is now “finished” in its “wet” or greenwood state. It may look a bit rustic at this stage but do not fear. Before you can get the final finish the wood needs to dry out as sanding wet wood doesn’t work very well. The sandpaper just gets clogged up and the fibres of the wood sometimes get a bit fluffy, so it’s best to leave it for a few days. I start sanding with 120 grit paper and work down to 600. This gives me the wood a polished satiny finish, although some people prefer a rustic look and feel with knife marks still visible. All you need to do then is oil the spoon to protect the wood and its finished. I wouldn’t put a hand carved spoon in the dishwasher, but if it is protected with linseed oil or food-safe mineral oils, it is an object which not only looks great but can be put to good use too. William Torlot and Marcos Frangos are running regular weekend retreats at Hazel Hill Wood, near Salisbury. If you are interested, check out their upcoming events or get in touch to discuss the possibility of organising a workshop with Marcos and William. If you want to find out more about green woodwork and their unique approach, have a look at the other Spoons and Spirit blog posts. Working with greenwood – what is it about freshly cut wood? One of the most common questions I am asked is, “Why greenwood?” Most people know that, as it dries out, wood naturally shrinks and has a tendency to warp and crack. What sense does it make to put effort into something which will unavoidably be damaged or distorted? The prejudice is well founded. Some objects are, indeed, wholly unsuited to being made in unseasoned greenwood. If elements have to closely and reliably fit against each other, with accurate dimensions of the finished product, making it from a material which will still significantly change in size and shape is quite a challenge (though not impossible). Similarly, where thick sections are involved and drying is uneven, tension is created at the surface where drying occurs faster than in the interior and cracks often result. Better to dry the timber first, for the shrinkage to take place and make dimensioning more predictable and for warping or cracking to have finished. Wood can then be selected defect-free or deformities can be machined away and “proper woodworking” can be started on a material stable in size and quality. But that is a bit one-sided. As wood dries out it becomes increasingly strong and resilient. Green wood is softer by nature than seasoned wood. The water content within the fibres lubricates the blade making it easier to cut and the fibres are less tightly bound together so it is easier to split. While a saw or abrasive tool such as a rasp might get clogged, bladed tools such as axes, knives and gouges require much less effort to use. Objects such as spoons or bowls have thinner walls so drying is more even. The resulting tension in the wood is lower and cracks are much less likely to form. Yes, the wood will change shape a bit, but the change does not affect the object’s functioning and may even enhance its aesthetic. So, where there is no clear need to use dry, seasoned wood to make an object, the use of greenwood is an option. But why do I prefer it? It is all to do with the softer material and ease of cutting. It is not the efficiency which is appreciated. Let’s be honest, power tools are extremely effective at processing wood as quickly as possible. But greenwood gives you the freedom to work with simple hand tools. You are not bound to a power supply. There is no accompanying noise and dust, or at least much less. And working with seasoned wood, however beautiful the timber might be, somehow slightly lacks soul with its natural unpredictability removed. Working with green wood on the other hand is truly organic. The tree from which it came is fully apparent. Its shape and structure suggests what is to be made with the hand of the maker influencing rather than imposing an outcome. The grain guides the cuts. Removing material is not simply the excess being cut away, but a form steadily being revealed. It is a mindful process where sharp blades provide a quick reminder should concentration drift. An object emerges, encouraged out gently rather than forcibly. That personal and active transformation forms a connection between the maker and the object which endures long after the process is completed. It is a meditative journey - the purposeful application of head, heart and hands intimately bound with the natural world by the wood on which you are focused. The reward from the connection is every bit as strong as any sense of achievement with the finished article. My favourite sound in summer – a chainsaw! Traditionally, wood has been harvested in winter. Originally, I guess it had something to do with people being pretty busy at other times of the year with farming activities. Concerns are also voiced, that when the sap is in full flow, cutting might damage the tree and make it susceptible to disease. Whatever the reason, it is noticeable that for a greenwood worker the availability of material diminishes significantly in summer. I spend my weekdays in a city where perhaps the seasons have less of an impact on people’s lives that in the countryside. Building sites need to be cleared and a tree surgeon’s work is perennial. The resounding staccato ring of a chainsaw maybe an irritation for many, part of the background city hubbub to others, but to me it is a beckoning call. The fact that beautiful trees are cut down in the name of human expansionist tendencies is sad enough. What is worse is that, in this day and age, time seems to be the only resource we really value. Tree surgeons here tell me of a time when they would cut and store timber. The market for firewood and supplying craftspeople brought in a handy supplementary income. Still today, they are not immune to the beauty of the trees they are cutting, especially mature ones or less common species. However, today it seems that there is no time or storage space to spare. More often than not, their “waste material” is shredded or sent off for incineration. And so, following the chainsaw’s call, I track down the source and make a polite enquiry - if I may be allowed to have or buy some wood. A short explanation of what I want to make is usually enough. It has been known for a spoon or a small bowl (which just happens to be in the car) to be shown and even offered in exchange. Interest is nearly always triggered and generosity follows more often than not. Trees have always been (and will continue to be) cut down or cut back by mankind to make space, but it seems that the desire to honour them and appreciate the beautiful material they provide runs deep.